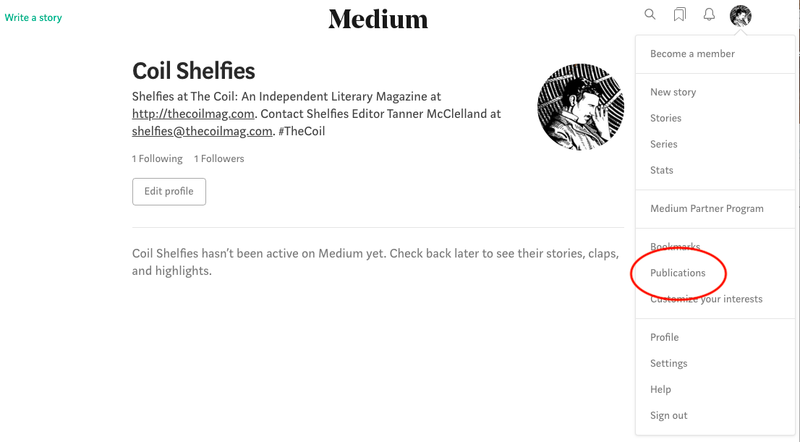 To have work published on The Coil, our independent online literary magazine, you will have to create a free Medium (our host site) account so that the published work is associated with you as the author. If you already have a Medium account, you may skip Step 1 and go to Step 2. 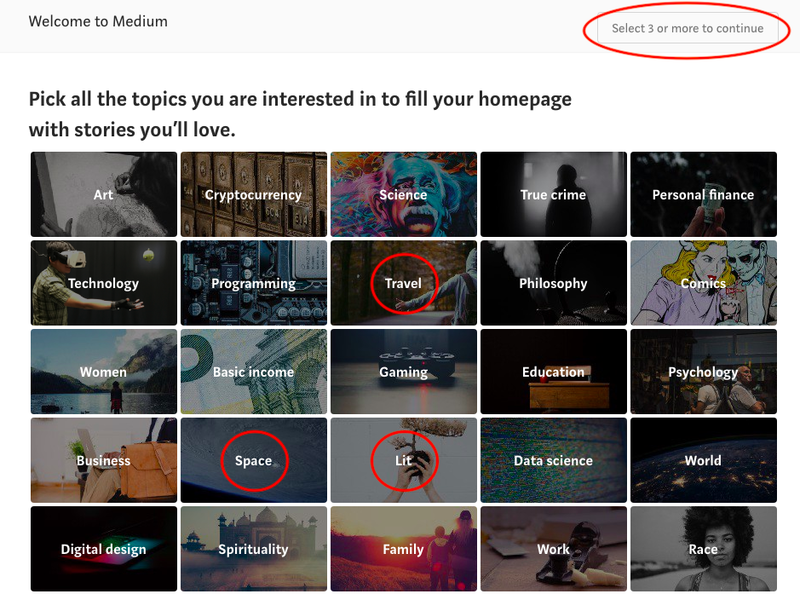 If you do not yet have a Medium account, begin at Step 1 to create a new one. Go to medium.com. Click GET STARTED. At the pop-up prompt, click SIGN UP WITH GOOGLE (which will show up automatically if your email address is with Gmail) or SIGN UP WITH EMAIL (which may show up if you do not use Google). You may also sign up with Facebook if that is your preferred method. If you have multiple accounts open on your computer, you may be asked to CHOOSE AN ACCOUNT. Select which account you want from the list. At the welcome screen, click DIVE IN. You must choose 3 or more topics of interest before you can move on to setting up your account. Pick any three that interest you. 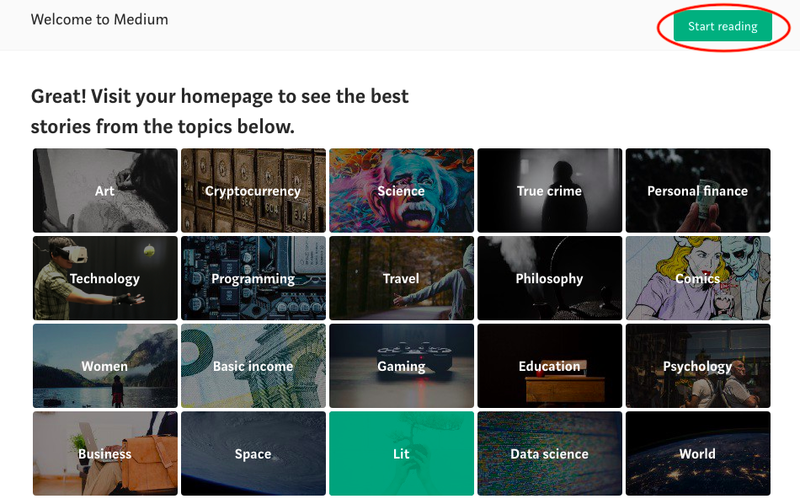 Once you have selected your topics, click START READING. You will then be taken back to the Medium homepage that has your profile icon up at the top right. If your email account is associated with a public picture, it will be displayed there automatically (but you can change it later). If your email account does not have a public picture, there will be a generic icon there. This is the icon menu from which you will operate your Medium account. Click that photo icon to set up your profile. It only takes a moment because your profile is very basic. In the dropdown menu, click PROFILE. You will be taken to an empty profile that has nothing filled in except the information gathered from your email address, which is whatever name is associated with your email account and a public photo if one is associated with your account. The photo may be low-resolution if it is pulled from a low-resolution input. To adjust your name, add a brief bio, and change your profile photo, click EDIT PROFILE. This is what editing your profile looks like in edit mode, and you can change all of the things circled in red, and then click SAVE. NOTE: Whichever name you use in the name space is what comes up on your published stories, so use your full writing name. This is what editing looks like in process. NOTE: If you want to include workable links, they must contain http:// or https:// protocol identifiers before the website URL. Links that do not include the protocol identifier will display as text, not workable links. The next step is to set your basic account settings. There is not much to this, but it adds finishing touches that you will want. Go to your profile icon menu dropdown, and click SETTINGS. 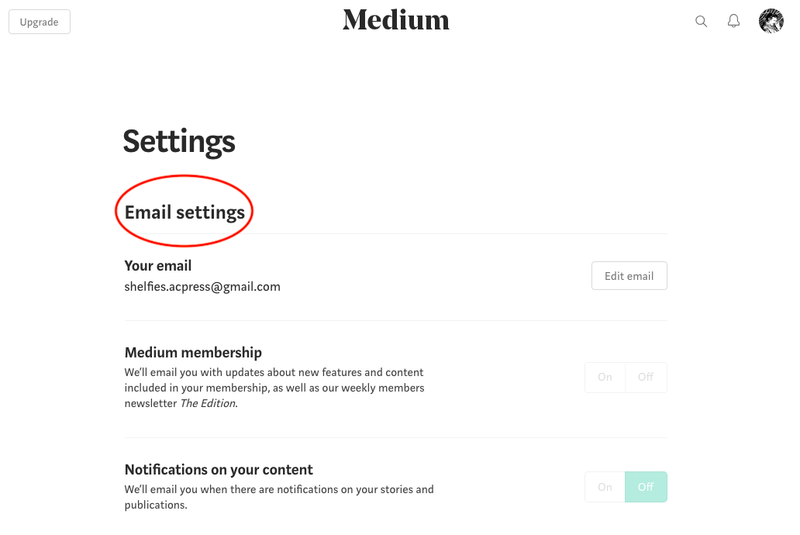 On your Settings page, adjust the emails and notifications that you want to receive from Medium. They send a lot of emails, so it is a good idea to do this step. Further down the page, under Account, you will want to set your username. This is the name that appears in your URL, acts as a handle for people to find you, and acts as a tag for people to tag you in stories that pertain to you. 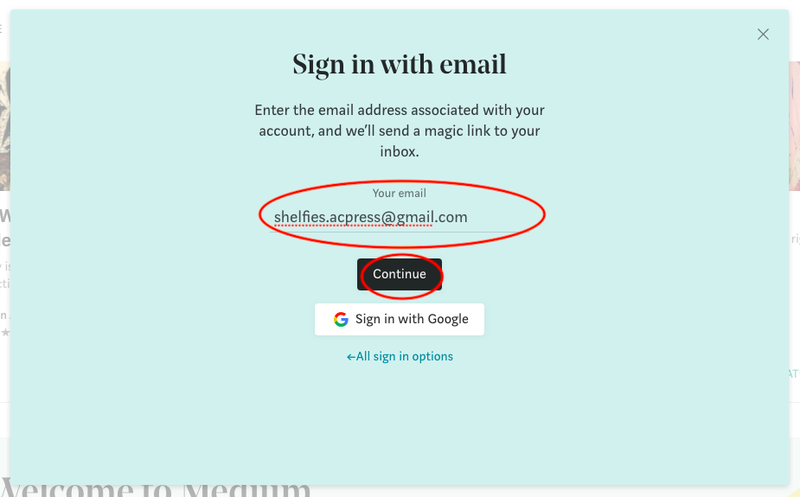 Medium assigns a username based on your email. 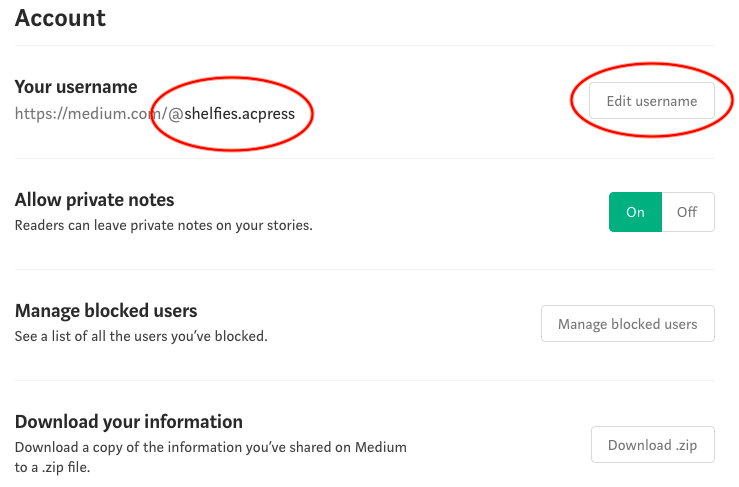 In the case below, our email account associated with this set-up was shelfies.acpress @ gmail.com, so Medium automatically assigned our username as @shelfies.acpress. We do not want that name, however, so to change it, click EDIT USERNAME. NOTE: Our recommendation is to be professional in setting your username, such as using your first and last name or your @handle associated with your professional Twitter account. 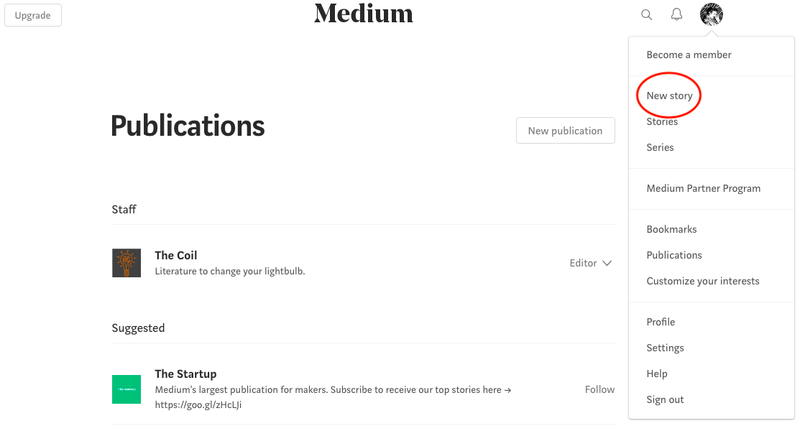 You now have an updated Medium account and can write for any publication that uses Medium, or for yourself on your own account. To write for The Coil, however, you have to move on to Step 2 to become a Writer on our magazine. First, please follow us at The Coil by clicking FOLLOW in the navigation bar, and follow us on Twitter and Facebook, too! Now that you have your account created, the next step is to become a Writer on The Coil. This step cannot fully be done by you manually; it requires approval by an editor at The Coil, and it will only be done for writers whose work has been accepted at the magazine. 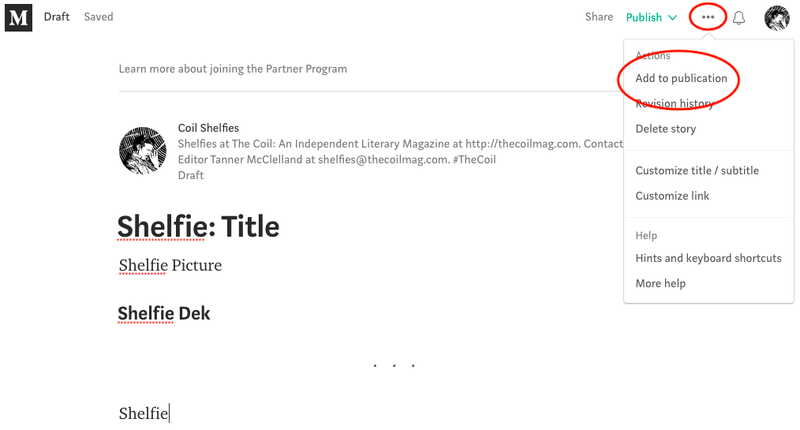 Once you have your username (created in the last steps of the above section), email your username to the editor who is working with your piece at The Coil. If you are uncertain which editor is working with you, you can find that information on our staff page, under The Coil tab. 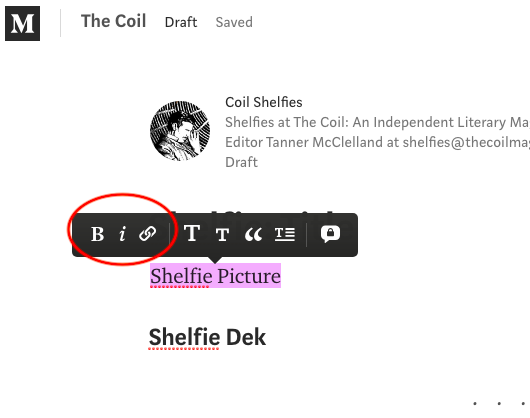 If your process of becoming a Writer has been completed by an editor, then The Coil will show up in your Publications list. Once you see the magazine appear in your list of Publications, or once an editor has told you that you are now added as a Writer to the magazine, you may move on to Step 3 to upload a Draft to the publication. After the initial Steps 1 and 2 of setting up your account, all you will need in the future to submit forthcoming or future work to The Coil is Step 3. 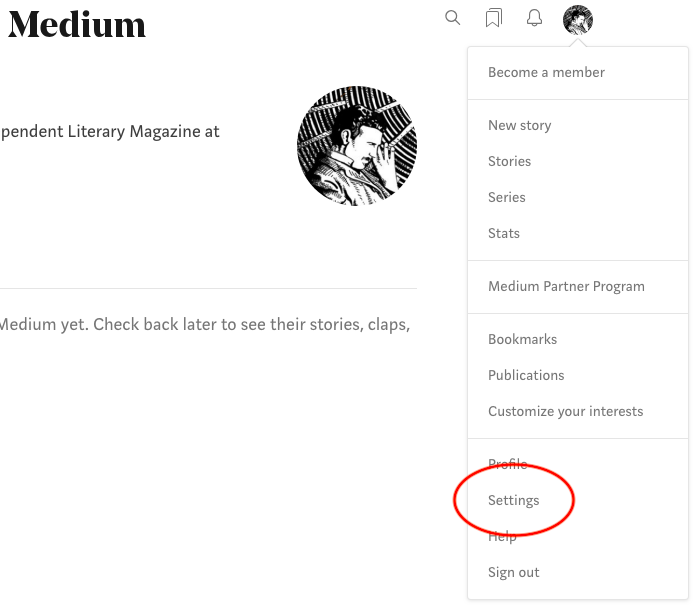 When you are logged into your Medium account, select the icon menu dropdown and click on NEW STORY. In the part that says TITLE, add your title. Your title may be changed to suit our editorial needs, but start out with what you want it to be. In the part that says TELL YOUR STORY, you can copy and paste from any word document. 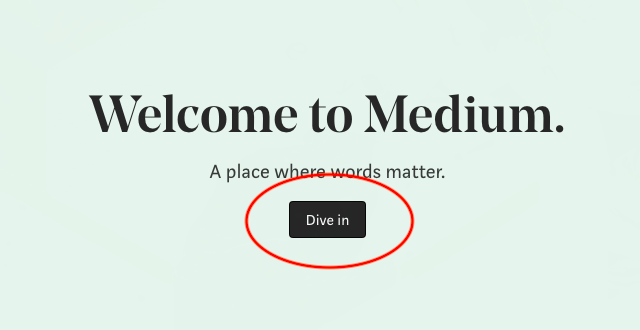 IMPORTANT NOTE: Medium *does not* back up previous versions of your story, so *please* do not type directly into the Draft and have that be your only version of the piece. Either copy that into a word processor before you submit it, or write in a word processor first and copy that into the Draft. Always have a back-up! 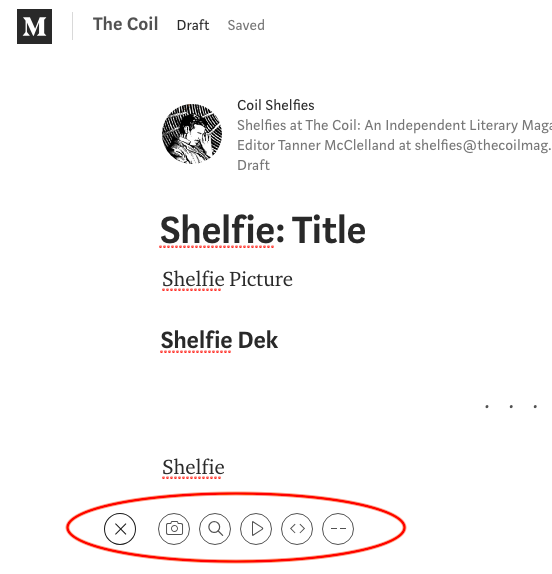 If something gets deleted in Medium, either accidentally or during editing, it is gone. You do not have to worry too much about formatting, but there are buttons for bold, italics, links, and other small formatting you may need. Editors will do the major editing. You should include links for anything you can, including proper nouns, titles, and statistics, and the links should go to the direct source or to a reputable source. If you have photos to upload, your editor will tell you how to turn in those photos. Any photos you include inside your Draft should be high resolution, at least 1100px wide, and should include credits and permissions. Do not add photos that you do not need. For instance, if you are writing about coffee, we will find our own commercial-use image of a cup of coffee; if you are writing an interview about a certain person, however, then you should acquire and provide a high-resolution photo (and credit) of that person. Once your story is inserted into your Draft, then you have to submit it to The Coil. This step is very important. Go up to the ellipses (three dots) up in the top right of your screen, and click on ADD TO PUBLICATION. A dropdown will show the publications list, and The Coil is listed with a radial dial. Click THE COIL. NOTE: If The Coil is not listed, then you are not yet an added Writer at the magazine, so you will have to wait for that process to complete before you can submit the Draft. Once The Coil is selected, click ADD DRAFT. It will then take you to a preview screen. (It may not show up on all drafts.) You do not have to adjust images, titles, subtitles, or tags; we will adjust all of those during the editing phase. You *will* want to UNCHECK the auto-checked box, however, that includes your story in the metered paywall. The paywall makes the story available only to paying Medium customers, with limited access to non-paying members; we do not want to restrict the access to our stories, so do not select that option. Then click SUBMIT TO PUBLICATION. 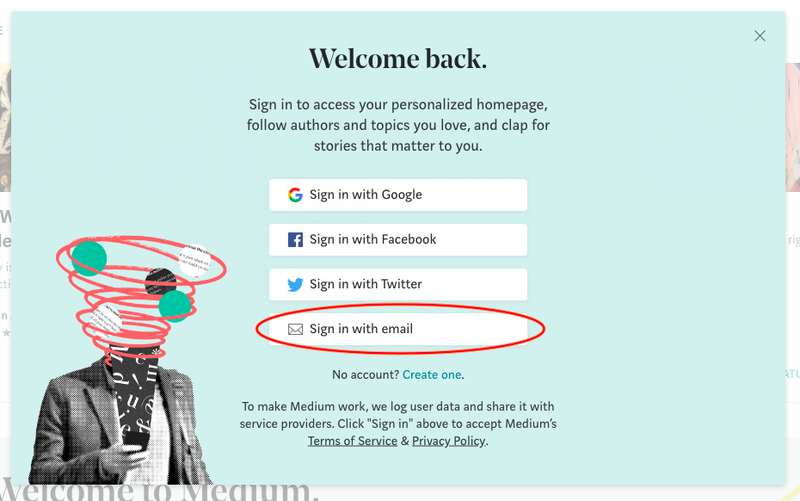 If you get signed out of your Medium account, you can sign back in by going back to medium.com and clicking SIGN IN. When the welcome screen pops up, click SIGN IN WITH EMAIL. A pop-up screen will ask for your email. 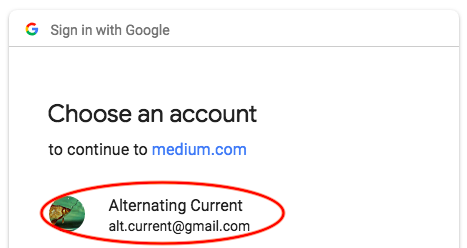 Enter the email associated with your Medium account, and click CONTINUE. A pop-up screen will tell you to check your inbox. 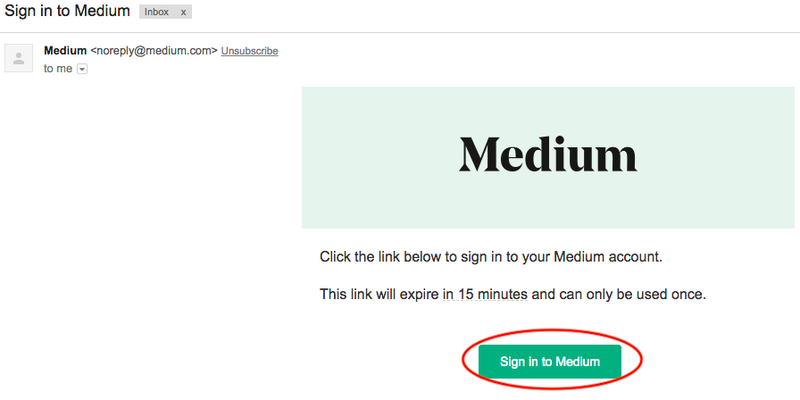 Click OK and check the email inbox associated with your Medium account. 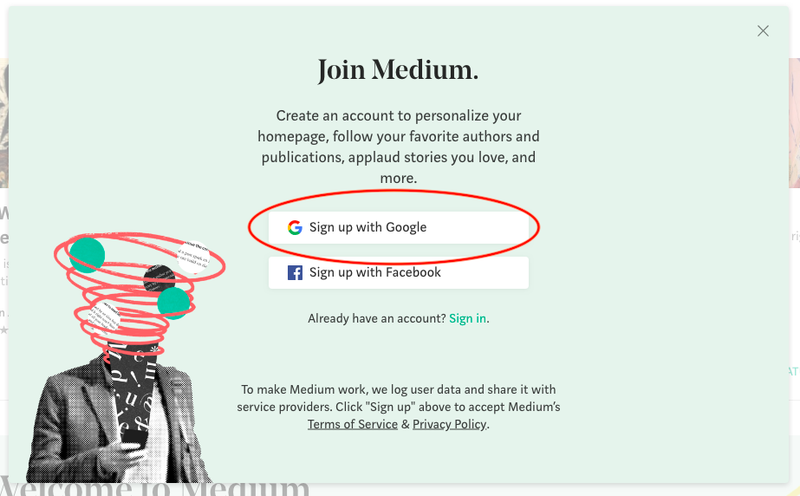 In your inbox, you should have an email from Medium that says SIGN IN TO MEDIUM. 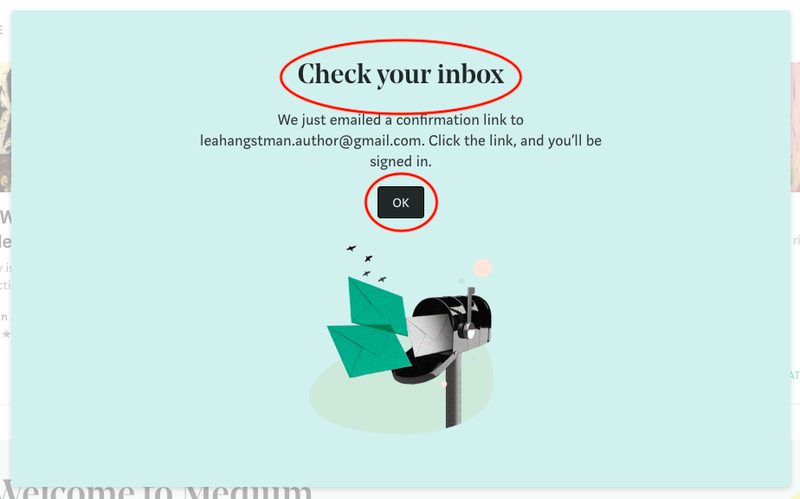 Inside the email, click SIGN IN TO MEDIUM. This link only lasts for 15 minutes, and once you have used it, it is no longer active, so you can discard it. If you miss the 15-minute window, start the sign-in process over. 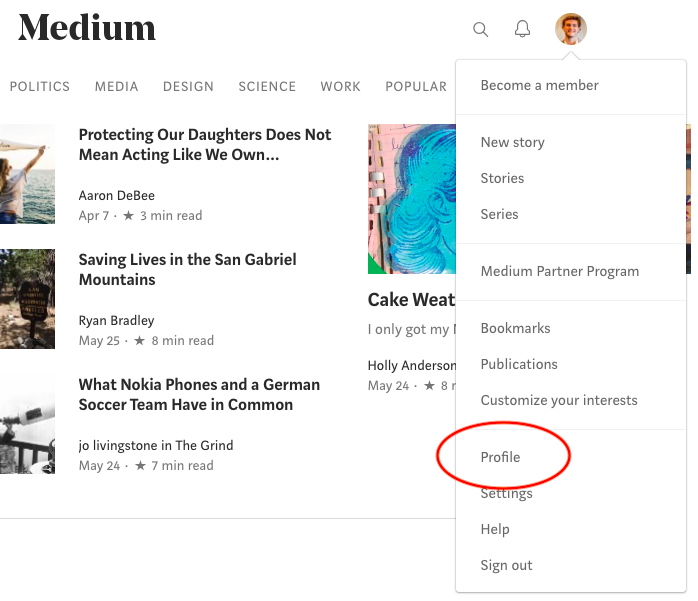 You will be taken to your Medium homepage, where you can navigate using the profile icon dropdown menu in the upper right corner.